James' Jetsam - Your Cruise Expert: I hate Big Brother! In fact even that statements probably a little too specific. I hate all reality TV! Big Brother, X-factor, Britains Got Talent, I hate the lot. The problem is my wife is a massive fan so I normally end up having to suffer through some of them, (woe is me). The reason I mention this is that a reality TV show has cropped up in the schedule that I think might actually be worth watching. It's called Showboaters and will start on the 13th Sep on Sky One. From what I've read about it it's going to be a cross between Big Brother and Britains Got Talent. 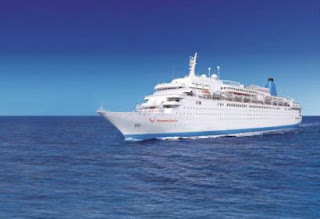 A group of young people will be put onboard the Thomson Dream and they will have to rehearse and then perform the weekly Saturday night entertainment on the ship. The winners will then get treated to luxury treats on the cruise all week whilst the losers will have to do all the mucky, grubby jobs that are normally done behind closed doors. I'm pretty sure that if it wasn't being filmed on a cruise ship I'd avoid it like the plague but the fact that you get to see all the places on a cruise ship that you wouldn't normally as a paying guest, I think will actually make this show really interesting.